When you think of the deadliest and poisonous animals in the world, what comes to your mind? Arachnids? Scorpions? Snakes? Jellyfish? Frogs? Sting Ray? Well, it’s a fact that most of the world’s most poisonous animals are either reptiles, arachnids, or undersea inhabitants. This scorpion is pale yellow in colour and translucent in appearance and is generally found in the Middle East and North Africa. It may look calm as cattle, harmless but the peril posed by this scorpion is extremely high. A deathstalker scorpion’s sting can cause a herculean pain as well as respiratory failure. Those with heart problems or allergies are most likely to die from a single sting. This octopus is about the size of a normal adult’s hand and it poses no small threat in comparison with other animals and creatures. If you ever happen to go for scuba-diving, you definitely don’t want to meet this creature since it is quite nearly the most venomous animal in the sea. Blue-ringed octopus is found in Australia, Japan, Indonesia and New Guinea. The venom from this animal can cause blindness, paralysis, respiratory failure and most likely, death. This cone-shaped snail shell i a creature which can deliver one tremendously dangerous venom. Mild symptoms may include pain, inflammation, numbness, and tingling. If you get stung by it, you will unquestionably experience blindness, respiratory failure, paralysis and eventually death. Since there is no anti-venom available to cure a person in case stung by this creature, therefore, the marbled cone snail is considered to be one of the most perilous animals in the world. They are mostly found in the jungles of India and China. They are recognizable by their wide hoods, and are able to spit their toxins on their prey whenever they feel like they are in danger. The toxin is highly painful, and once it enters the blood stream, it can cause death within a very short time, in seconds. P.S. Seven ml of venom from this animal is enough to kill an elephant—or twenty human beings. This jellyfish is widely considered to be the most venomous animal in the world. It can be found in the waters surrounding Asia and Australia, and is so transparent that it is nearly invisible even if you’re in no mood to encounter it. 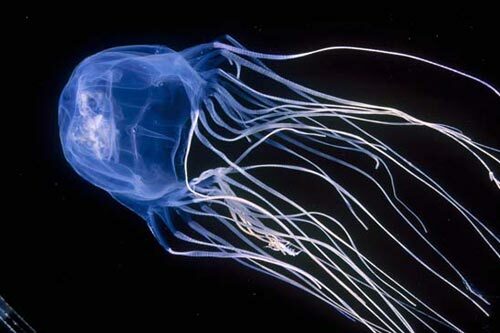 The tentacles of the box jellyfish generate highly toxic venom. Once the toxin reaches the blood, blood pressure increases. This can lead to a heart attack, and ultimately death. If stung by one of these jellyfish, you’ve a very little chance to live because its venom is so . poisonous that it can kill you in a matter of seconds. All I’d say is that whenever you happen to go in those aforementioned areas, just keep your eyes open and stay away from these creatures. Why Graduates With Good GPA Fail To Get A Job? Solitude- The Quality Of An Astute Sapient? 11 Weird Words We Bet You’ve Never Heard Of, But Felt Them For Sure!